You are here:Home-Domain.com-What Is a Website Domain Name? We are in the midst of the e-commerce boom, a radical mercantile exodus from brick and mortar stores into online vendors. Thanks much in part to the meteoric rise of Amazon. A once humble online book retailer, now the world’s largest corporation, Amazon’s modern-day Sear’s catalog allows consumers to buy just about anything they can dream of online and receive it in a matter of days. In the twenty-some-odd years since Amazon modernized the e-commerce practice, virtually every retailer has shadowed this move, forced to focus heavily on their online platform and sales, or else suffer a quick death, unable to compete with those who adapt to rapid trends. According to Business Insider, “Approximately 70% of Americans (230 million) will make an online purchase in 2018, contributing $474 billion to total retail sales, according to Statistica’s Digital Market Outlook.” What this study illustrates is that e-commerce now accounts for roughly ten percent of all retail within the United States, a staggering percentage that is only expected to grow at a rapid pace. This economic outlook is a warning to all businesses both old and new about how vital a business’ online presence is for its future success. If you are launching a company or thinking about diving into those waters, odds are you have tossed around names for the business or already have one in mind. Picking the right name, one that is original, easy to say, and easy to remember, is a tricky task. A task that is made more difficult because it is critical that the chosen name not only represents your product or brand but also distinguishes itself from various competitors within the marketplace. Landing on the ideal name consumes time and energy, and what many forget to account for when deliberating on their future business name is whether or not it is available as a website domain. If that desired domain name is unavailable, all your brainstorming may be for nothing, or you may have to pay a hefty price to the owner. To prevent this from happening, it is vital that you be well versed on domains, domain names, and domain name availability. Below, we will dive into the ins-and-outs of these crucial topics so interlinked with a company’s ability to succeed online. If you have not previously owned a website, or do not consider yourself to be computer savvy, you may find yourself at a loss when it comes to discussing these things with your web designers or web developers. It may seem overwhelming, but do not worry or feel discouraged. Domains are not as confusing as they appear. 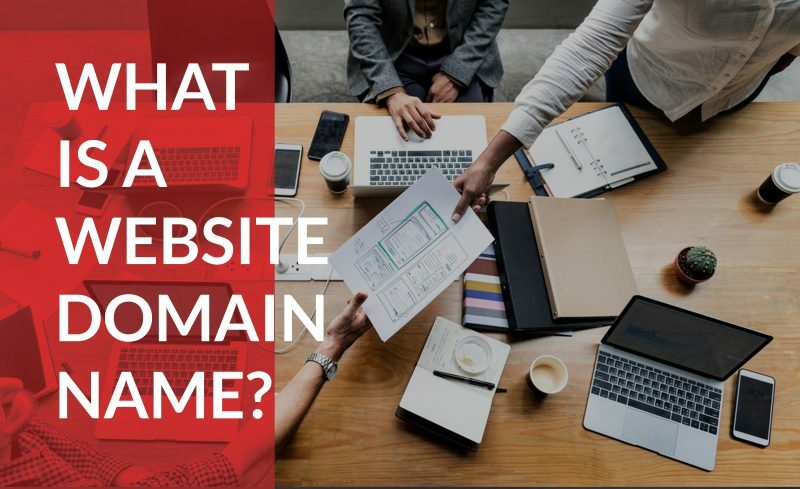 In order to dive in, it is crucial that you first know the difference between a website and a domain. A website is the virtual storefront prospective shoppers browse upon searching your name within their web browser. The digital layout of this online shop is composed of data, images, files, and pages that culminate in the product that appears on one’s monitor. A computer locating a website is not all that different from how we go somewhere new by following a map that leads us to the physical address. But for the computer to reach its intended destination, it must first know the route it must take as well as the terminal point. To identify and distinguish web addresses. IP addresses are either 32-bit or 128-bit strings of numbers separated by periods, like 142.421.3.5. Since human memories are limited, remembering these IP addresses would be basically impossible. To account for our limitations and to make it easier for internet users, computer scientists created the domain name system by creating a registry that ascribed a particular name to every possible numeric IP address. This creation of the domain system allowed the internet user to choose between two viable paths towards their intended destination. The first path available is the longer, more arduous route, which requires an input of the specific numerical sequence. The other path is made significantly more user-friendly by creating a virtual shortcut made by simply entering the intended domain name in a web browser. .com – Com is short for commerce and is the domain regularly associated with a commercial website. The most valuable website for both small and big businesses alike are those registered in the .com domain. .edu – Edu is the domain used by an educational institute or university. For example, a student or teacher’s email address or the school’s web address might look something like Harvard.edu, Stanford.edu, or Yale.edu. .gov – This domain name is intended for any governmental agency, agent, office, or official. The White House’s official website is whitehouse.gov. .Int – Int is intended for an international organization. .Net – Generally used by network providers whose primary occupation is networking. For example, Cox.net is the home of Cox Cable’s website. .Org – The domain for any organization. .Mil – The domain for the United States Military. “.Com” is the most popular and highly sought after domain extension, and rounding out second and third are “.net” and “.org.” While these were the original seven, recently, there have been a wide array of new domain extensions made available. Therefore, increasing the availability of domain names to choose from. Any company’s goal for their online presence is to maximize user interactions and garner as much internet traffic as possible in the smartest and most economical way. A memorable name can help a business do just that. Names tend to form lasting linguistic neural connotations that influence our feelings or perceptions of a person, place, or object. Because of this, nailing the businesses’ name is vital, and that name can act as a cornerstone of the brand’s identity, reminding the public of exactly what it is they are selling. A domain name is the name of the website and follows the @ symbol in an email address, or follows the www. in a website address. When asking someone how to find you online, you always tell them your domain name. Examples of domain names include Apple.com, Google.com, Facebook.com, Reddit.com, Twitter.com, Wikipedia.com, Youtube.com, etc. Domain names that go before top-level domain extensions must fall within the rules, procedures, and guidelines laid down by the DNS (Domain Name System). Such second-level and third-level domain names must be reserved by end-users, which is typically handled by domain name registrars. Any name registered with the DNS is considered an official name and cannot be used by an alternative party. Such names are case-insensitive, meaning that capitalization does not matter, although it is standard procedure for domain names to be written in lowercase. While one is not required to buy the same domain name as that of the name registered to the business, when it comes to search engine optimization, it is wise to choose an available name that is closely linked to the brand. Even if the names are not identical, it helps to have a guidepost for prospective customers who are searching your businesses’ name online. Domain names can be used for either or both an email account or a website address. The cost of a domain name will vary greatly depending on many different factors. However, once a domain name is purchased, you can choose whether or not to use it for an email account or for a website. You may hold onto it like you would a tract of land that was purchased as an investment. However, it is impossible to have a website or an email account for your business without first locking down that specific domain. This domain name registration does not instantly create a website, it only means that you have reserved that domain upon which you may now construct a website. So, if you start a business and come up with a great original name that has yet to be taken, you can register that domain name and copyright the name in order to protect it even though the actual business itself may still only be a fledgling idea. For example, Mark Davis, owner of the of the Oakland Raiders registered the domain name LasVegasRaiders.com and Vegasraiders.com over a decade prior in case the team was to move from Oakland to Vegas. Had he waited, someone else may have registered the domain name and then Mark would have been forced to buy it at a premium rate. Such an investment, what is known as a high-value domain, is quite common and worthy of consideration. Brand Protection – By establishing yourself as the premium name, you can ward off competitors who might try and establish a domain name akin to yours. Such a name could drain away customers. Establishing Authority both offline and online – Utilizing a high-value domain for your website and company email address helps build credibility both in person or on the web. By establishing your company as the first, the original, such a name can grant you credibility and give the appearance that you have been successfully operating for quite some time. By owning such a name, a customer is more likely to innately trust your product or service, regardless of whether or not that credibility has been earned. Garnering more traffic – Premium domains naturally receive heavier traffic as a result of direct type-in or google referral traffic. Type-in traffic refers to a customer who is searching for a product directly into the search bar of a web browser without utilizing Google’s search engine. So, for example, a customer searching for a new bike might simply type in bikes.com into their browser. There, they will likely find a wide array of bikes which are available for purchase. Direct type-in traffic is the optimal type of traffic a site can receive, since it costs nothing in advertising, is highly targeted, and the inquirer is further along in the purchasing process than a casual window shopper. Thanks to their age and the number of backlinks accrued, premium domains also amass plenty of referral traffic thanks to links from other websites. Improve Visibility – High-value domain names are typically brief, to the point, and catchy. They are intuitive and easy to recall. By having such a name, you position yourself on the internet’s main street, rather than establishing a location off the beaten path. Such real estate often sells itself with little to no advertising due to natural traffic. Increase SEO – Premium domains are generally keyword-rich and filled with high-quality keywords which tend to increase your website’s search engine rankings. Domains and domain names play a critical role in signaling to potential customers within the online marketplace as to what good or service you are selling. Selecting the perfect, creative domain name that is not only relevant but available will require a good bit of brainstorming and strategizing. This investment, however, is not only worth it but necessary for future success for your business in the digital world.